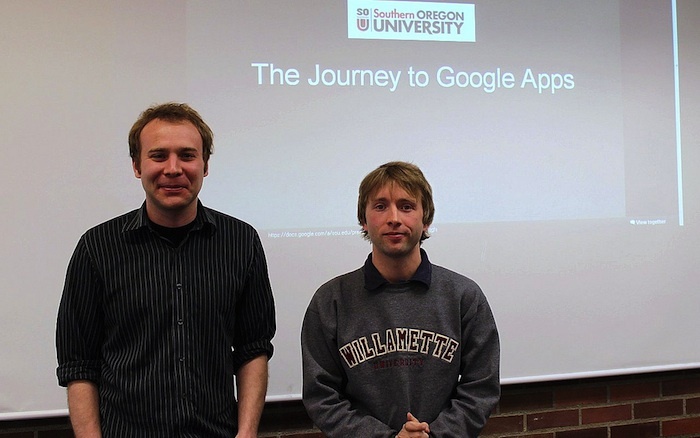 In April, I presented two sessions on Google Apps for Ed at the Southern Oregon Ed Tech Summit. It was a great event, co-hosted by Southern Oregon University and Southern Oregon Education Service District, with support from Oregon Virtual School District. I had a free hour between Esther Wojcicki’s thoughtful keynote and my first session, so I sat in on The Journey to Google Apps, led by Andrew Krug & Daniel Defreez. The session was a technical one, focused on domain management and configuration options. BUT, the beginning of the story held the spark for this post. And for much of my work this past year and the next. I tweeted this little tidbit and picked up a new term, consumerization. (Thanks, @thesethings.) Before that day, I had heard the word, but I hadn’t put it in context of what I see around me. During the next week, it reverberated through my brain, louder each day. I’ll synopsize the Wikipedia article on consumerization — consumer tech has eclipsed work tech; hold on tight. The phrase was first coined a decade ago, but I think we hit a tipping point in education sometime during the past two years with the confluence of shrinking budgets and the suddenly-ubiquitous iPad. In April, in another of those freaky convergences, I was transitioning to a new role as the CIO for the High Desert Education Service District in Central Oregon. We provide technology support for the Bend LaPine, Crook County, Redmond, and Sisters school districts. Consumerization is impacting our schools, teaching, and learning. Every day. I see it as an opportunity, but it’s a challenging one from an IT perspective. When this year’s high school seniors were in kindergarten, there were a measly 50 million users on the Internet. By the time they graduated this spring, over 1.3 billion users were surfing and creating content. Computers evolved quickly during that decade too, changing from the dusty boat anchors in the corner of offices and classrooms to mobile communication tools that fit in a backpack or even a pocket. If we are no longer the chiefs, what are we? My hope is that we become the sherpas for our teachers and students in their choices. We still provide infrastructure and backbone (wireless networks in every building is top priority). We still try as hard as we can to keep our students safe on the Internet without stifling the amazing learning opportunities that it presents. We build apps, explore and manage tools in the cloud, and connect our users to the resources they need in the friendliest, easiest way possible. In short, it’s going to be a messy decade, but one where we get to help address equality of access for our most vulnerable students; policy and safety for all our students; and tech skill boosts for our teachers. The IT department doesn’t become less important or less needed. In fact, I believe it’s the opposite. We make the trek to the summit possible. Over 90% of Southern Oregon students and faculty chose a tool they were already using in their personal lives. Over 90%. Get those 90% using a tool that they’re already happy with and start tackling more exciting things on the to-do list. Derrick. Thanks for your thoughtful comment. I agree, especially with your parting words. I'm becoming increasingly wary of the term edtech as something that lives on its own. Technology is a way to get something done, hopefully easier or better.